When it comes to love, your heart has the best advice. Relationships are not a simple subject to talk about. And strangely, everyone wants to give advices when it comes to them. People will tell you advices they themselves do not even follow and they will just make you more confused. Add the difference in generations and cultures and you have a bowl of advices that will confuse anyone. These days the tolerance for relationships is drastically lowered than it was a century ago. People are more free. But they are confused. So we want to tell you that nobody has it all figured it out. Forget most of the things people told you and follow these 3 simple pieces of wisdom. Everyone wants to tell you how to live. 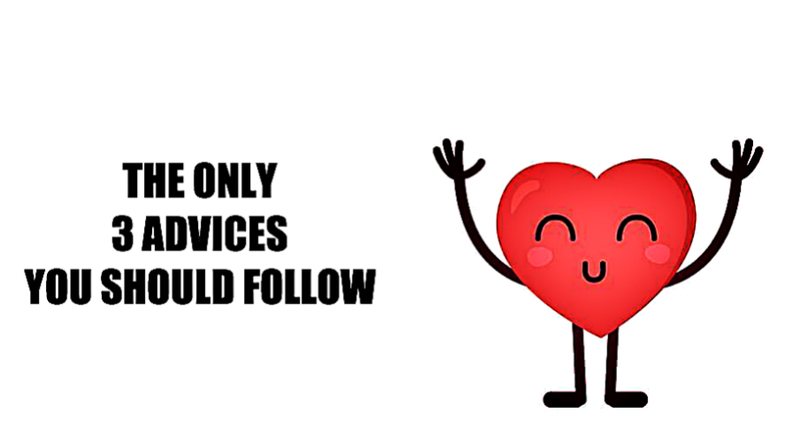 Funny how most of them do not follow their own advices. But most people don’t know what you really feel. In fact, nobody knows you to such extent, only you know your own heart. If your heart becomes excited for someone, follow its wisdom. People can speak all they want but at the end of the day your happiness is your own. Your heart knows what you need in ways the conscious mind cannot comprehend, it knows what your soul needs to grow. So listen to your heart before anyone else. Listen to advices, don’t be foolish, but prioritize your heart. 2. Love is something you maintain daily. If you are already in a loving relationship, good for you. Finding the right person with who you can build a loving relationship is not easy, especially in modern times. However, most people fall into the trap believing that getting into a relationship is the hard part, and after you get into a relationship it’s all fun and games. But the truth is, finding someone who you would build a relationship with is the first step, it’s the start of this game. That’s why it’s called building a relationship. The love you feel for each other will not be always as bright as it is, but that’s just normal. Love between two people is something you take care for. Something you maintain. Don’t listen the fairytales others want to tell. Some days you will argue, some days you will laugh, but keeping the love alive is both of your responsibility. 3. It’s better to be single than with the wrong person. Your friends and family might rush you into a relationship. They will scare you that you are too old, or that your standards are too high. But the truth is they don’t know what they speak. They repeat biased and outdated opinions that elder cultures established. These are modern times. There are opportunities and ways to customize your way of living however you like. Don’t settle down for someone just because you are scared of being alone. Don’t settle for someone just because your friends and family said you should. What kind of life is that? Instead, learn to be fine being single, learn to be whole by yourself, and settle for someone who shows you the magic of being alive. Listen to your heart, make its advices a priority. Accept the fact that love is something that demands proper care and responsibility. Wait for the right person, it’s worth it. Follow these 3 advices and you’ll be happy.